After chasing Axis forces out of Africa in the spring of 1943, the Allied armies prepared to return to Europe. 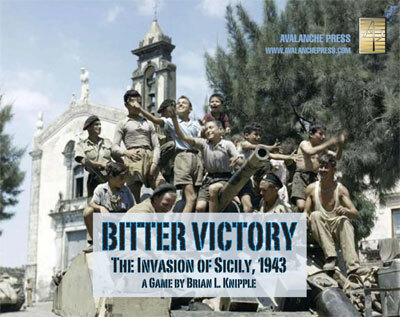 After studying several possible landing sites, the British and Americans decided to invade Sicily. Strategically located in the middle of the Mediterranean Sea, its capture would help secure Allied communications through this vital waterway and de-stabilize Italy’s fascist regime. In June, the British Eighth Army landed on the island’s eastern coast and the American Seventh Army on the south. Axis forces resisted bitterly, but finally were chased off the island. The game includes four scenarios, covering Axis and Allied plans as well as the historical situation. The game system, used previously inAlsace 1945 and Red God of War, takes only a couple hours to play. Game pieces represent battalions, regiments, brigades and divisions. Headquarters are vital to activate units and send them into action; supply is also important to keeping your units at full efficiency and players must choose how to allocate their resources. There will never be enough of them to accomplish everything at once. Bitter Victory comes with one 22x17-inch map and 180 die-cut playing pieces.